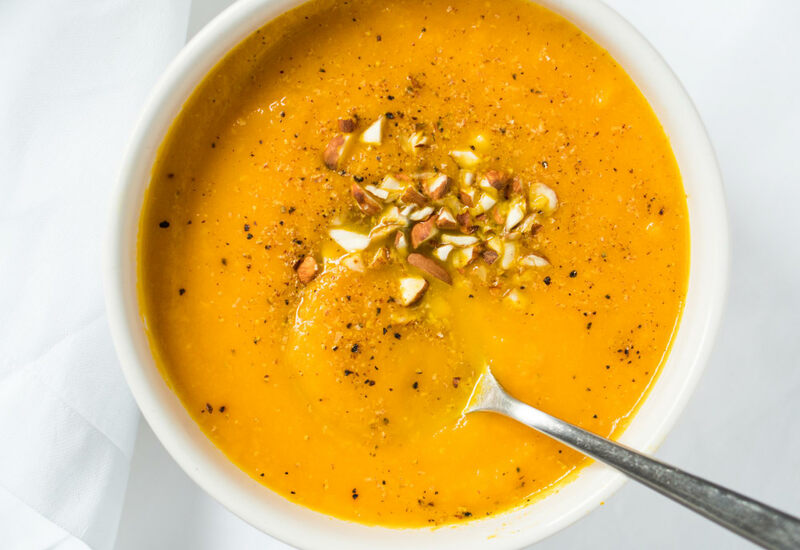 This vegan pumpkin soup recipe is a delicious fall staple and basically the epitome of pumpkin spice. Using unsweetened pumpkin puree makes it super easy—no need to roast pumpkins beforehand. The squash is spiced with a savory mix of cinnamon, nutmeg, cayenne, garlic and onion for a warming, comforting one-pot soup. Full-fat coconut milk adds richness and a creamy texture. Use an immersion blender placed directly in the pot for easier blending. We (highly!) suggest making a large batch and freezing the leftovers for a rainy day. Serve topped with toasted almonds for crunch! If you prefer to use fresh pumpkin, feel free! Cut the pumpkin in half, remove the seeds, and roast it at 350F° (175°C) until tender, 45 to 60 minutes. Scrape pumpkin flesh from peel, and use roasted pumpkin pieces in place of pumpkin puree. Per Serving: 199 calories; 14g fat; 17.4g carbohydrates; 4g protein; 0mg cholesterol; 444mg sodium. Couldn't wait to try this vegan pumpkin soup! So yummy and savory. I've been eating it all season. I also garnished with roasted, salted pumpkin seeds! This recipe is by far one of my favorites. It's so rich and creamy, thanks to the coconut milk. I love the onion and garlic flavors paired with the cinnamon, nutmeg, and cayenne spices. The toasted almonds on top gave it the perfect crunch and texture, rounding out this soup nicely.